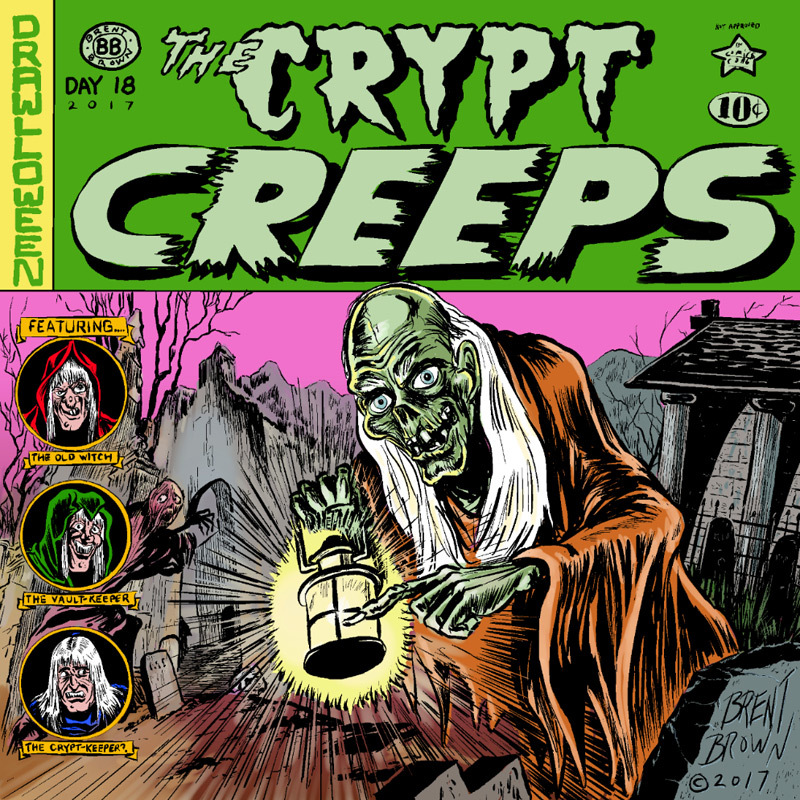 Having already come up with similar themes for “Return from the Dead” and “Tombsday” already this year, it was difficult to be too original with the crypt creeps prompt. I knew the obvious one would be the “Crypt-Keeper” but I tried to use the more well-known HBO puppet version of him to illustrate the original EC comic history behind the character, as host of their “Tales From The Crypt” comic, along with his fellow horror comics hosts: The Old Witch and The Vault-Keeper. The original Crypt-Keeper was pretty much just a creepy old dude with long, white hair and he seems a bit surprised to find his mummified TV incarnation pointing at him. …. 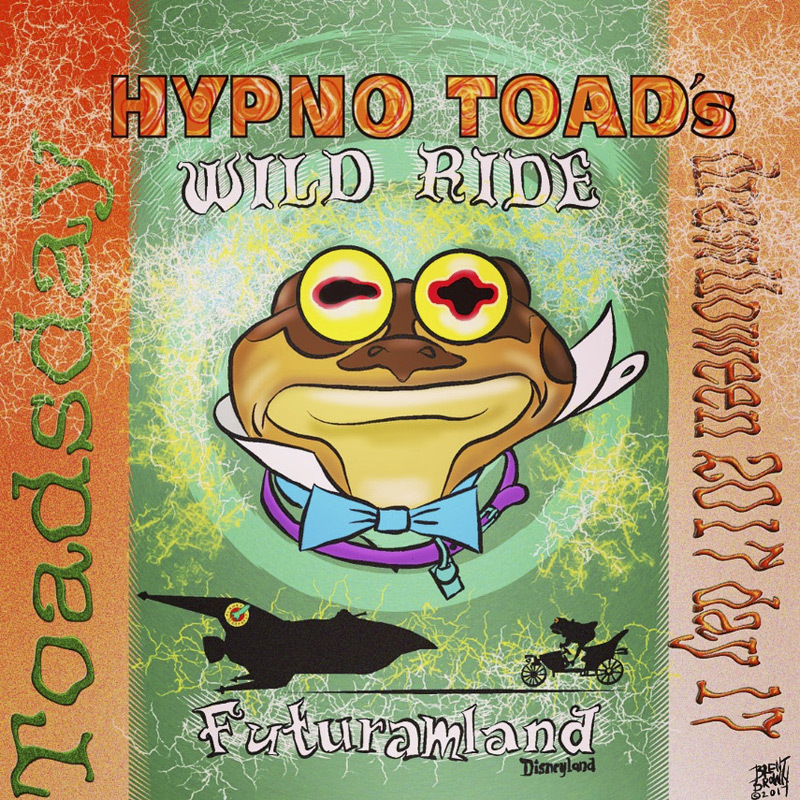 so here’s a mashup of Futurama and Fantasyland with Hypnotoad as Mr. Frog from Disney’s version of The Wind in the Willows and the ride that still exists in Disneyland, but sadly, not in Disney World any longer. If you ride this, the yolks on you. 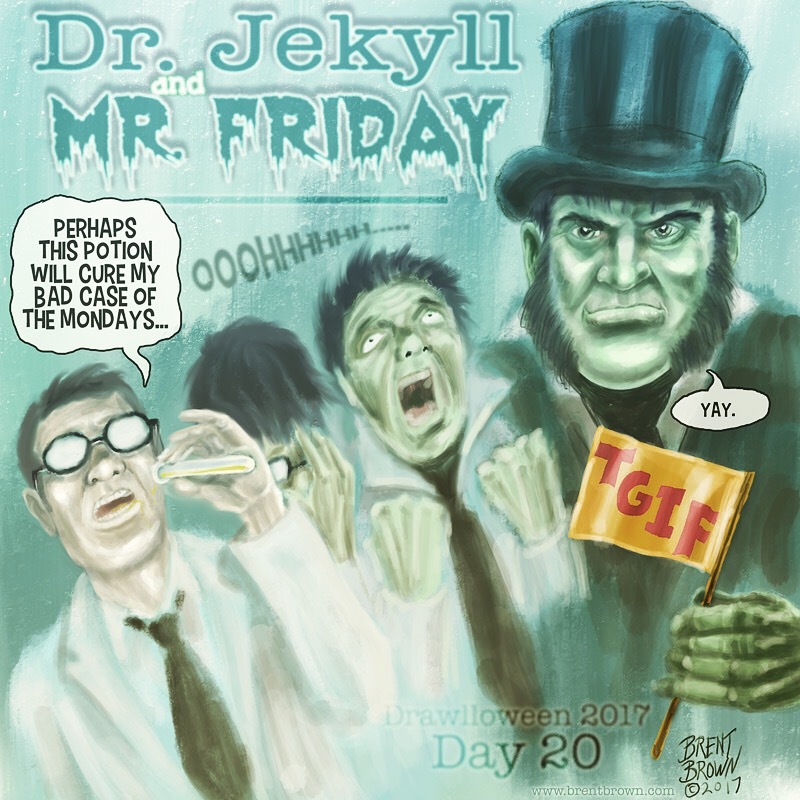 I had a hard time coming up with something for this because I feel like I used up all my “carnival” themed jokes last year on the “Mummy Monday” and “Carnival Creeps” days of Drawlloween 2016. I already made fun of the food, carnies, rides and sideshow, leaving only the games of chance, I suppose, to skewer. 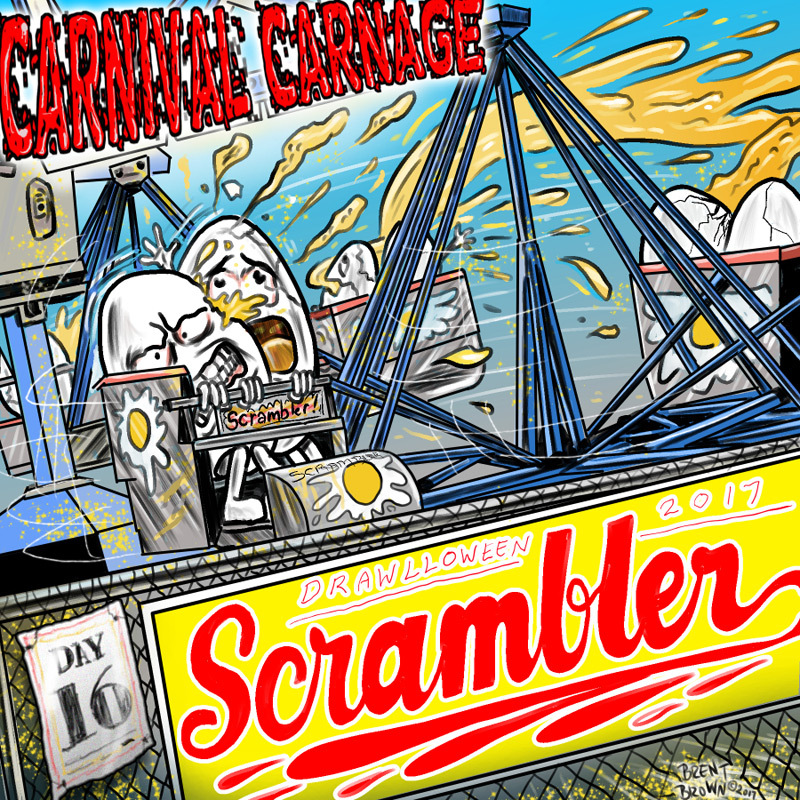 Not coming up with a good idea for ring toss or stacked milk bottles, I settled for the “carnage” of the poor eggs who were undiscerning enough to get on a ride called The Scrambler (actually my favorite ride at these kinds of places). 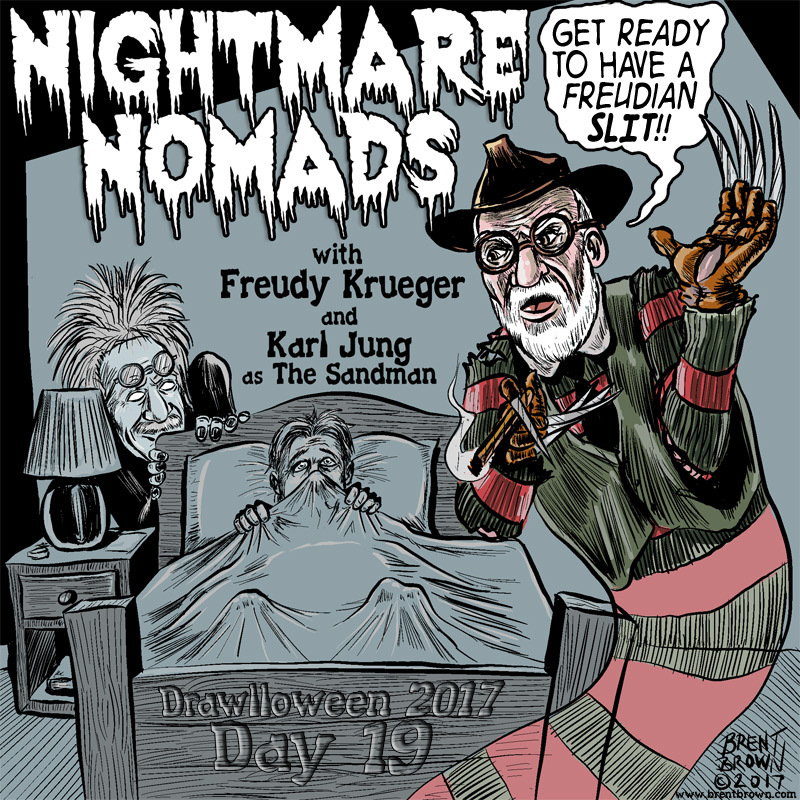 Since I already did a scary cornfield with various scary versions of iconic scarecrows last year, I went a different direction this year, kind of in keeping with what seems to be a theme of recontextualizing non-horror pop culture into a more macabre, Halloween theme. 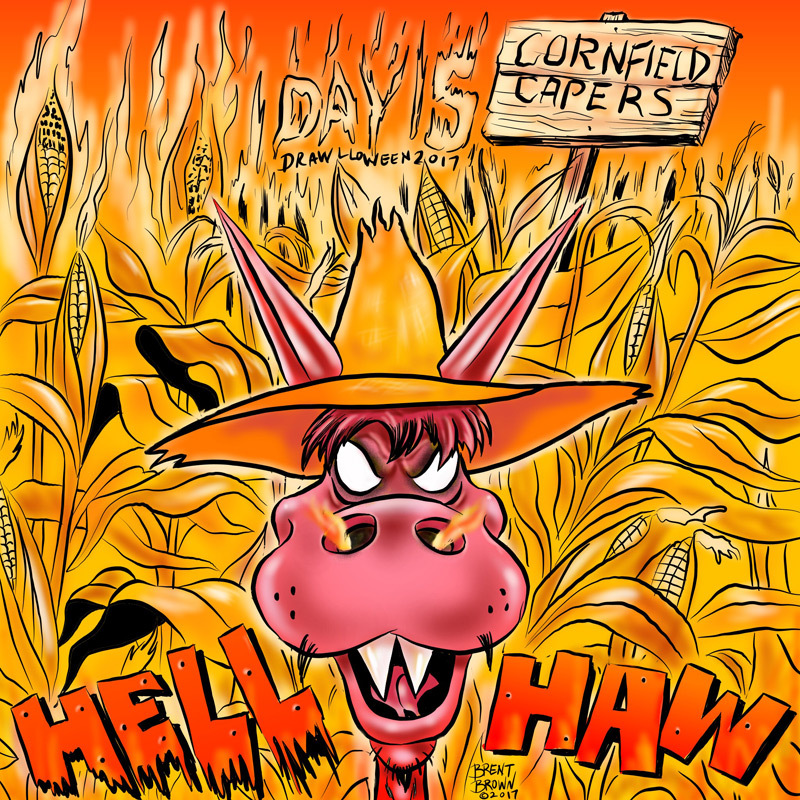 This time choosing the iconic cornfield of Kornfield Kounty, the fictional setting of TV’s long-running country-flavored answer to Laugh-in: “Hee Haw” and their cartoon mascot donkey who uttered the eponymous onomatopoeia title. … and the Tootsie Pop version of #sarahconnor speaks for me the first time I saw #theterminator and couldn’t believe how many times it took to kill it. 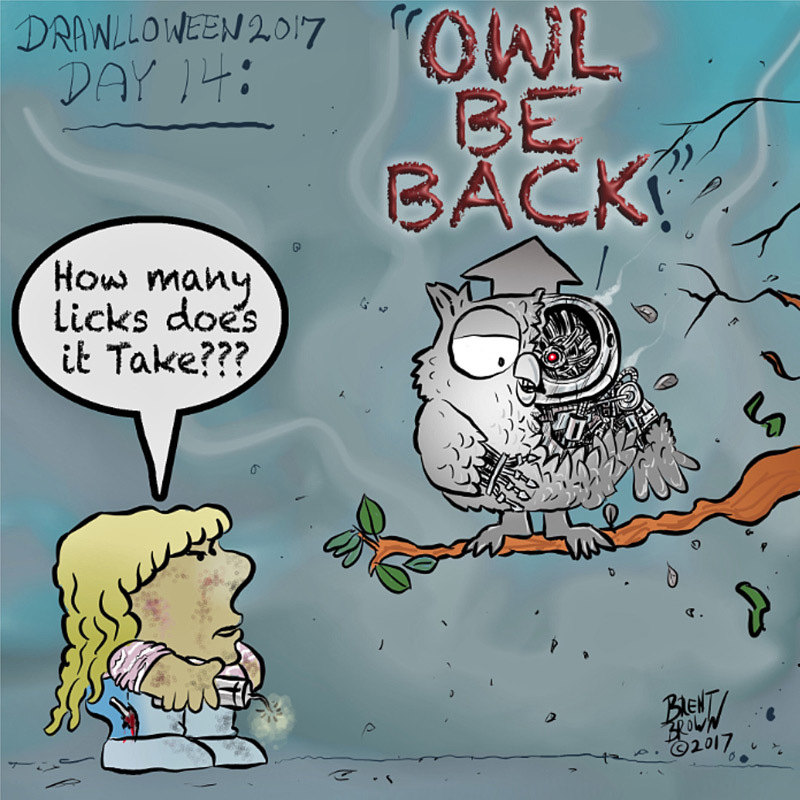 #owl #howmanylicksdoesittake? 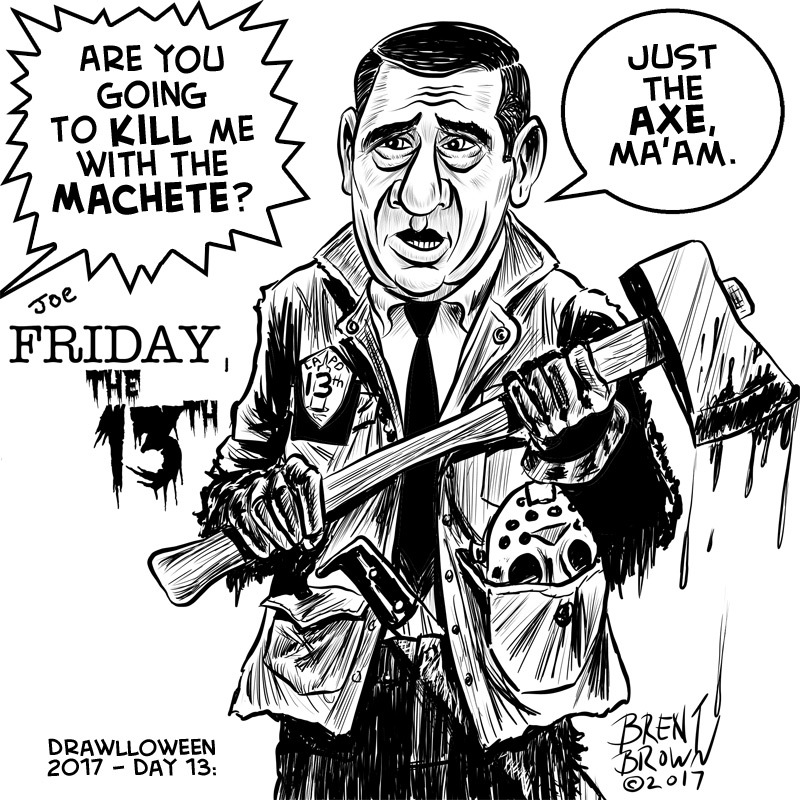 Drawlloween 2017 – Day 12: Ah! Reel Monsters! Acknowledging the pun, but still taking it literally, I used the characters from Nickelodeon’s “Aaahh! 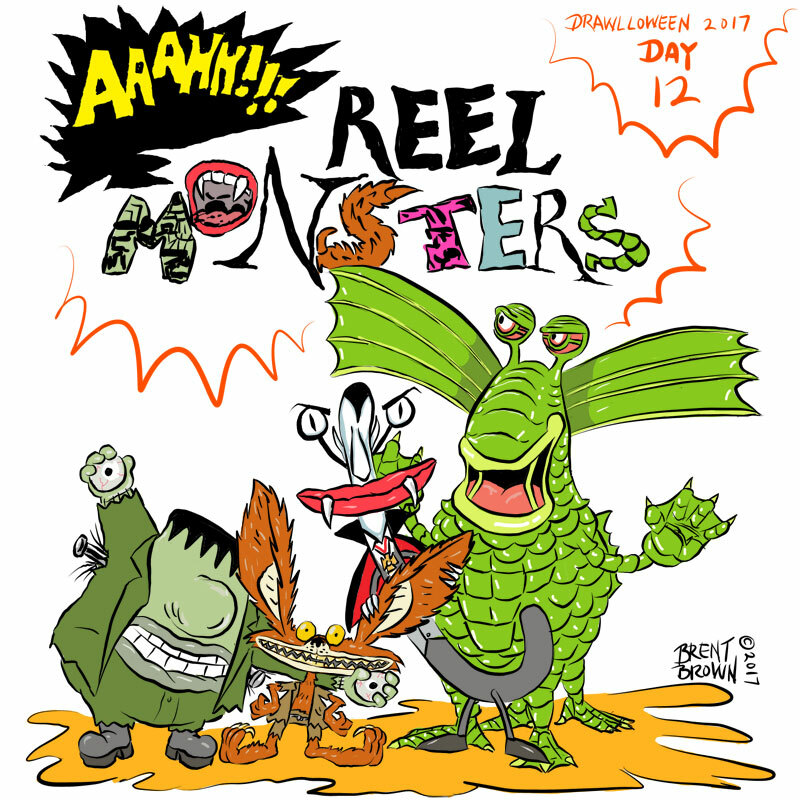 Real Monsters!” 90s cartoon and portrayed them as the classic Universal movie “reel” monsters from the movies Frankenstein, Dracula, The Wolfman and The Creature from the Black Lagoon. 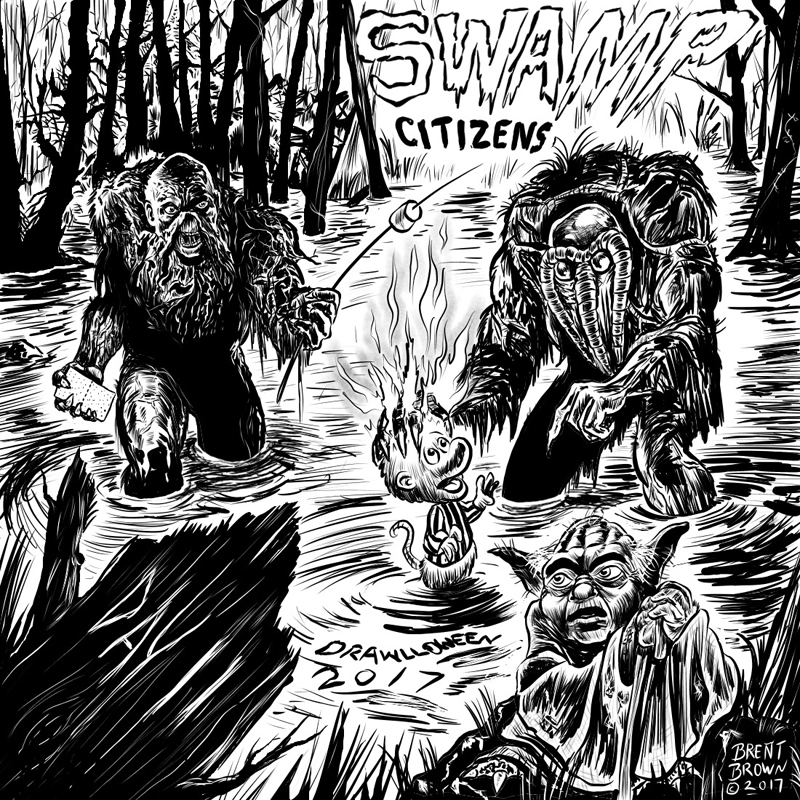 Here is is with the other “swamp” citizens: Marvel’s Man-Thing, Walt Kelly’s Pogo and Star Wars’ Yoda. 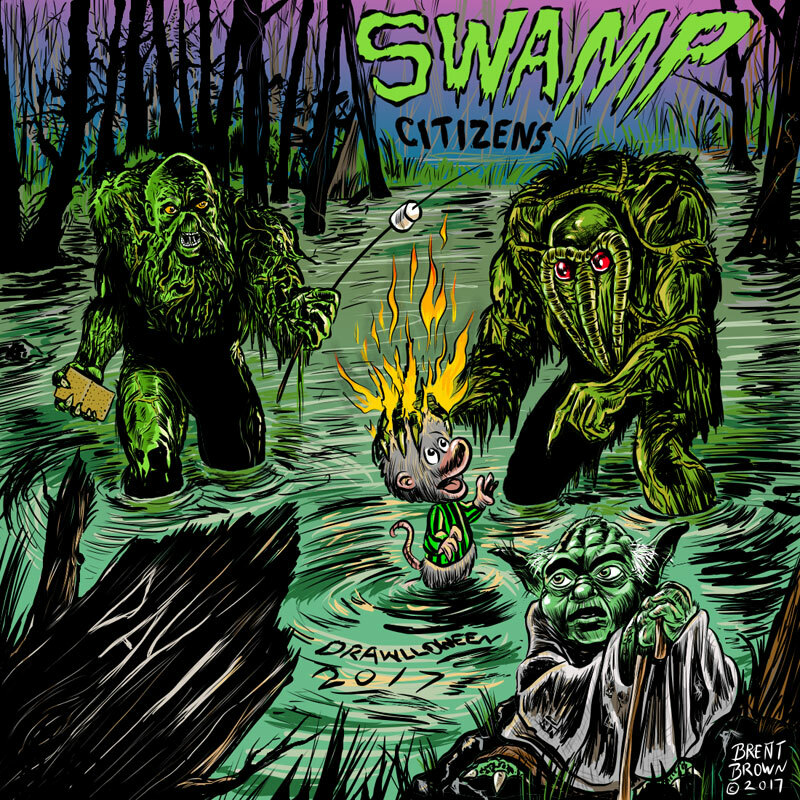 Upon reflection, I could have added more swamp people, like Kermit the Frog, Gollum and Shrek, but didn’t have room or time. I liked the stark contrast of just the black and white inks, but then I had to add color to make all the characters stand out better.